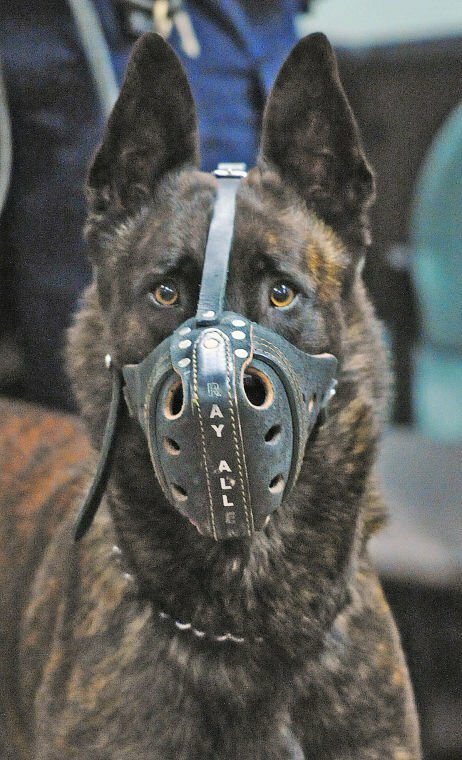 Yuma Police Department’s newest K-9 officer, Raico, a three-year-old Dutch Shepherd, is the picture of intensity as he waits to be introduced Thursday at department headquarters. Thanks to the generosity of the community, the Yuma Police Department has a new canine officer, who has already taken a bite out of crime in the short time he has been on the force. In just his second day on the job, Raico, a three-year-old Dutch Shepherd, was called to the scene of a traffic stop and alerted to the presence of drugs. When officers searched the vehicle, they found a large amount of methamphetamine and several weapons. Raico — who is partnered with his handler, Officer Susan Malone — becomes the fifth dog in the Yuma Police Department’s K9 Division. Sgt. Eric Egan, president of the Fraternal Order of Police Yuma Lodge 24, said the money to purchase Raico was raised through donations from the community. Egan explained that Malone approached the organization in May asking if it would be possible for it to assist in a fundraiser to solicit enough money through donations from the community to purchase another canine for the police department. One she was given the go-ahead, Egan said Malone spearheaded the fundraising and solicited all the donations by herself from businesses and the community. Egan went on to say that the Fraternal Order received the donation on June 6 and by Aug. 7 had received more than $15,000 in donations. “I think that is an awesome thing the community has done,” Egan said. Raico was purchased for $10,368. Egan said they also used some of the remaining funds to buy some canine equipment and first-aid kits and pay some vet bills. Someone also donated a bullet resistant vest for Raico. “We still have some money left over for other related expenses that will come up in the future,” Egan added. Lekan also expressed his appreciation to the community, saying without its generosity, Raico’s purchase would not have been possible. In giving a background of the department’s K-9 program, Lekan said it was initially started several years ago under the previous chief, Jerry Geier. However, the department soon realized the important role the canines and their handlers played in reducing crime and continued to add dogs to the force. Raico, Lekan said, is from Holland and like all other YPD canines is dual-trained in narcotics detection and as a patrol dog, meaning they are trained to assist officers with law enforcement tasks.